I’m sure all gamers are familiar with the great paradox that while games can engross us and enrich our lives, they are also a kind of easy escape from reality. Reality that perhaps deserves more attention. As a designer, there’s a challenge in designing games that address reality in other ways than through pure escapism. You won’t find a lot about this in books on game design and game theory, but it’s a well-known problem in cultural studies. An example from drama is German playwright Bertolt Brecht’s concept of Verfremdung – his plays would introduce disturbances that break the suspension of disbelief. This awakens the spectator, and reminds him of reality, so he doesn’t get lulled into a detached fantasy world of distorted perspectives but remains self-aware and critical throughout the performance. 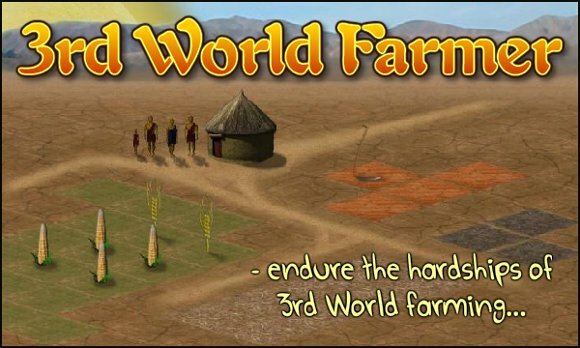 3rd World Farmer is an attempt at creating some disturbances in what starts out as a classical resource management game. By breaking the genre’s established, formal conventions (fairness/winnability) it aims to wake the player to a whole new dimension of the game’s content, and point to a larger reality. Perhaps the reality of you being terribly upset about losing a video game, while people are starving to death around you. Or the reality of you thinking there’s nothing you can do about it, when in fact there is plenty you can do – at the click of a button. The concept for 3rd World farmer was an old idea that I finally got the chance to see realized in university, where we built a prototype as a team project in game design class. The game has since been developed with the help of many contributors and volunteers. It has become part of the permanent exhibition in the Action Center to End World Hunger at Ground Zero in NYC, and it has been covered in USA Today, Escapist Magazine, and many other media. It’s also been picked up by large gaming portals and has been played 3-4 million times so far. My role in the production: Initial Concept, Game Design, Programming, Localization Management, Press Relations.